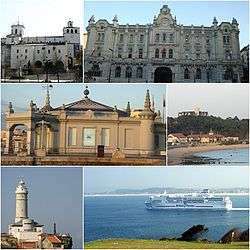 The port city of Santander (UK /ˌsæntənˈdɛər, -tæn-/, US /ˌsɑːntɑːnˈdɛər/; Spanish: [santanˈder]) is the capital of the autonomous community and historical region of Cantabria situated on the north coast of Spain. 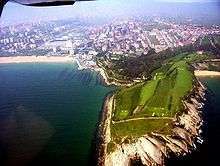 Located east of Gijón and west of Bilbao, the city has a population of 178,465 (2013). Santander houses the headquarters of multinational bank Banco Santander, and is the location of the founding of the namesake company. The origin of the earliest human settlements in the current Santander is not easy to establish because there are few written and archaeological data. However, there would appear to be good practical reasons for ancient settlers to have chosen the north side of the bay, sheltered from it and safer from the storms of the Bay of Biscay, on the north side of the promontory of Somorrostro and along the ancient Becedo estuary. Moreover, the hillside provided good visibility for spotting potential attackers, making this the ideal place for the foundation of a stable settlement, which was to evolve throughout the Middle Ages. In Roman times the first written mention appeared, the port being known as Portus Victoriae Iuliobrigensium to Pliny the Elder. Roman archaeological remains found in the Peninsula Magdalena include the remains of a building with mosaic floors, a Hermes bronze and other material monetary and ceramic..
On July 11, 1187 King Alfonso VIII of Castile was appointed abbot of San Emeterio and lord and master of the town. His jurisdiction tended to facilitate maritime traffic, fishing and trade, activities that contributed to the Abbey by means of taxation. Other local economic activities included wine growing and making pickles. During the twelfth and thirteenth centuries the population was contained within the walls of two different pueblas. La Puebla, the oldest, on the hill overlooking the city facing the bay, included the old castle, the Abbey of the Holy Bodies and the cloister. It had three rows of houses, separated by Rua Carnicerias and Rua Mayor, where the homes of prominent people of the town were, as well as those of the Abbot's canons. Meanwhile, the Puebla Nueva contained the convent of Santa Clara and San Francisco, which gave its name to one of the main streets; other important streets were the Rua de la Sal, The cavalcade Palace, Ribera, Don Gutierre, Puerta de la Sierra, Gallows and the Arcillero Rua. The two pueblas were joined by a bridge over the river that divided Becedo and flowed down to the shipyards, which were ordered by the king to take timber from the Cantabrian forests for shipbuilding. The villa was required to give the monarchy a ship per year. The city owes its existence to the excellent harbour of the Bay of Santander. 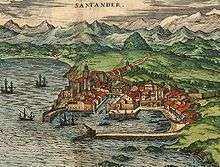 Santander was an important port for Castile in the later Middle Ages, and also for trade with the New World. It officially became a city in 1755. Santander fell victim to a great fire in 1941. Fanned by a strong south wind, the fire burned for two days. The fire started in Cádiz Street, next to the harbour, the Cathedral and the medieval quarter. The fire destroyed the Old Town Hall, Jesús de Monasterio and Vargas streets and Atarazanas square buildings. It led to a major change in the architecture of Santander, away from the older small stone and wood buildings with balconies to the enormous blocks of flats built during the reconstruction. In 1942 the old stations (Estación del Norte and Estación de Bilbao) were demolished and the new station was built, so in the zone affected by the fire, only the old Bank of Spain, the Porticada Square, the Market of La Esperanza, the Post Office, the New Town Hall and some small streets with old buildings survived. There was only one casualty of the fire, a firefighter from Madrid killed in the line of duty, but thousands of families were left homeless and the city was plunged into chaos. The fire destroyed the greater part of the medieval town centre and gutted the city's Romanesque cathedral. In the early 20th century Santander became the favoured summer residence of King Alfonso XIII, who built the Palacio de la Magdalena as the residence of the royal family during the holidays. The city gained great popularity from this and from the 19th century enthusiasm for sea bathing, and it remains popular with the Spanish for beach holidays today. During this period, Santander was (like the rest of the northern cities) a very important economic centre. It had one of the biggest harbours and was connected by rail to the rest of Spain. The municipality of Santander has included, since 2009, the city of Santander and the urban areas of Cueto, Monte, Peñacastillo, and San Román, places that were once villages but are increasingly being assimilated into the city centre. 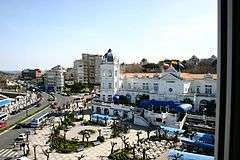 Santander and these towns have several neighbourhoods that are not separately administered and do not have specified boundaries but some of which do have a certain personality that differentiates them from other areas of the city. Currently the city of Santander is working to adapt the municipality to the law of large cities and thus decentralise power in several districts. The climate of Santander is oceanic (Köppen climate classification Cfb), the annual thermal oscillation of the average monthly temperatures reaching around 10 °C (50 °F). Humidity is quite high throughout the year and sometimes reaches more than 90%. Average daily maximum temperatures vary from 24 °C (75 °F) in summer down to 13 °C (55 °F) in winter. Summer temperatures are much cooler than in the more southern large cities of Spain, but are typical of the Atlantic coastline. In general however, summers are warmer than further west on the northern coastline. The damp, mild winters are more typical of the mediterranean climate but the frequent precipitation in summer prevents Santander and the northern coast being classified as cool-summer mediterranean, despite having similar temperatures to many such areas. As regards to daytime temperatures, summers in Santander are similar to areas of Northern France, Southern Britain, and continental Northern Europe, and comparable to spring-like conditions along the Spanish mediterranean. The maximum temperature reached in Santander Airport was 37.8 °C (100 °F) on 27 June 2009, and the minimum temperature −5.4 °C (22 °F) on 21 January 1957. The warmest maximum daytime average for a month was in August 2003, with 27.1 °C (80.8 °F). Subtropical months (mean above 22 °C (72 °F)) are however rare. Another weather station recorded 40.2 °C (104 °F) on 17 August 1943. Sunshine hours are very low by comparison with the rest of mainland and southern Spain. With just around 1650 hours of sunshine, Santander is about as sunny as London and Paris, and quite a bit less sunny than most of England's south coastal regions. The bars and restaurants of the old town are popular with tourists, as well as the El Sardinero beach a couple of kilometres away. Since June 2007, Iñigo de la Serna, of the People's Party (conservative) has served as Mayor of Santander. The most important political parties in the local area, in addition to the PP, are the Socialist Party of Cantabria - PSOE (social democrat), whose current spokesman is Jesús Cabezón Alonso, and the Regionalist Party of Cantabria with Rafael de la Sierra González. Throughout its history the most influential political parties have been of the ideological right wing, especially the PP. The Governing Board, chaired by the mayor, is currently composed of 18 PP councillors. The municipal council consists of 27 members, 13 of the PP, 5 of the PSC-PSOE, 4 of the PRC, 2 of the Citizens, 2 of Ganemos, and 2 of the United Left. The following tables show the results of municipal elections in 2003 and 2007. As a service centre at the regional level, Santander contains important public institutions and private organisations with a large number of employees, including Marqués de Valdecilla University Hospital, the University of Cantabria and Grupo Santander. Activities related to culture, leisure and tourism are an important part of the city's economy, and the regional and municipal authorities look to augment the summer tourist trade with additional offerings, including conventions, conferences, cultural festivals and cruises. Banco Santander, Spain's largest bank and corporation, is headquartered here. 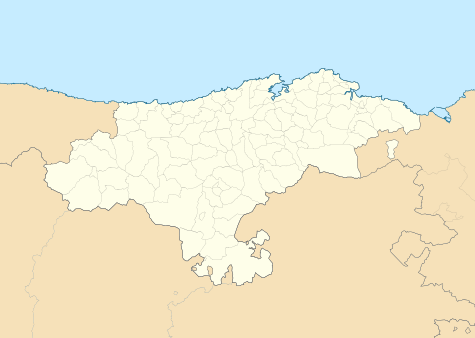 As of 2004, Santander has a population of 183,800. The number has remained fairly steady since 1981. Spain's low fecundity rate and aging population have combined with rising immigration figures to keep the population growth fairly stagnant. The Dam of Gamazo, monument. View of the bay of Santander. Currently the growth of port activity, increased value-added traffic (vehicles and containers of mostly liquids and solids) for storage requiring a lot of already scarce ground, and insufficient depth for some types of ships, is forcing the Port Authority to consider the long-term construction of a port outside the bay. On 29 June 2005 Santander celebrated the 250th anniversary of the granting of the title of "City." Paseo de Pereda with the Palacete del Embarcadero to the right. Building of Bank of Santander, where it originated and where it has its registered office. First beach of El Sardinero. In the background the Sardinero Hotel located in the Plaza de Italia, which dominates the view of the sand. The lower temple, called "cripta del Cristo" was built around 1200 on other earlier Roman buildings. It is 31 meters long and 18 wide, organised into three naves. Its style is a transition from romanesque to gothic and is accessed by two doors of late romanesque. Here the remains of the Holy Martyrs (Emeterius and Celedonius) are kept, which reached Portus Victoriae (the ancient Roman Santander) by boat. The upper church was built between the late 13th and 14th century. After it was completed the gothic cloister was built. El Sardinero was in 1840 a rugged area of Santander environment. Since 1850, the first tourists started arriving and created some facilities (bath houses, eateries ...). Following the summer of Queen Isabella II in El Sardinero in 1861 and Amedeo of Savoy in 1872, the area acquired great fame and began to attract many tourists. There was a spectacular urban and cultural development with the construction of several hotels, inns, cafes, trains and trams arriving at El Sardinero. The Palacio de la Magdalena, eclectic style, English influenced, built in 1909 by public subscription as a gift for the Spanish Royal Family. El Hotel Real was opened in the summer of 1917, in a privileged location overlooking the bay and the open sea. It is a five-story building, with south porch on a high terrace. The style is modern with an air of eclecticism, by the architect González Riancho. Next to El Hotel Real stands the old house built for Don Adolfo Pardo from 1915–1918. Of mountain style with well marked tower, it was designed by the architect Gonzalez Riano and today is the palace of Emilio Botín García de los Ríos. 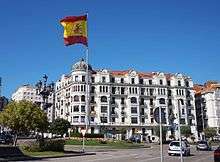 The Gran Casino del Sardinero completed in 1916, has some relationship to El Hotel Real and is one of the symbols of the city. It has a terrace balcony which is accessed by a monumental staircase. The two-story central body is framed at the sides with two octagonal towers, covered by domes, whose edges involved, from top to bottom, shafts with capitals for each floor. 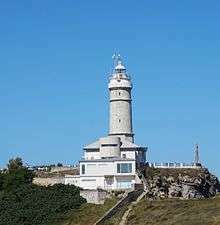 The Lighthouse of Cabo Mayor presides over the entrance to the Bay of Santander. This privileged balcony overlooks the Cantabrian sea and in the city is now one of the most emblematic and evocative for citizens and visitors of Santander. Located in the extreme northeast of the city, the area where the Lighthouse of Cabo Mayor is located is part of a larger area consisting of the headlands of Cabo Mayor and Cabo Menor. The physical configuration of this space is defined by its particular geomorphology, marked by its beaches and cliffs of coastline and a rugged terrain with maximum dimensions of 50 m above sea level. Historically located on the outskirts of the city, the area of Cabo Mayor and Cabo Menor has applications and relevant functions: signal maritime defensive position, horse racing, camping, public park, golf course, etc. Thus it became a tourist landmark and one of the areas of greatest landscape and environmental variety. Monument to José María de Pereda in the gardens of the same name. The prints are seen around the bust of Pereda, depicting scenes from their works. Paseo de Pereda (The ancient pier is a promenade overlooking the bay and the towns of Somo and Pedreña. cafés can be found as old as "El Suizo" where, in the past, traders and military writers met, such as Pereda himself). The Gardens also have the same name (which, in turn, is the monument to the writer José María de Pereda, which contains references to his works). Reina Victoria Avenue (location of chalets overlooking the bay. Through this street is access to the beach Los Peligros). Paseo del General Dávila (El Alta) (former Meteorological Observatory of Santander, I.E.S. José María de Pereda, Conservatorio Jesús de Monasterio). Calvo Sotelo Street (Ministry of Finance, Post). Burgos Street (It is one of the oldest streets of the city. It may be considered part of the old part of town, although the first references to the street date from the mid-18th century. The title of Burgos Street was awarded in 1845. The pedestrian-only street has benefited the trade of the area and its residents. This street is the headquarters of the ONCE and the Plaza de Juan Carlos I). Alameda de Oviedo (Paseo full of trees, runs from the streets of San Fernando and Vargas, parallel to them, between Cuatro Caminos and Numancia). Avenida de los Castros (In this broad avenue are located most of the universities centres of the University of Cantabria). Las Llamas Atlantic Park (Open to the public on 11 May 2007, but today is still under construction. The park was initially budgeted at 22.5 million euros, but its price has risen 39.1% (8.8 million euros) for the incorporation of improvements). Piquío Gardens (so called because they are shaped like the beak of a ship that "enters" into the sea, referring to the views offered at the end of the garden). Plaza de Pombo has traditionally been a meeting place and focus of collectors and children, to exchange stamps or stickers from various collections. Plaza del Ayuntamiento (City Council Square). Plaza de Pedro Velarde (Pedro Velarde Square) or Plaza Porticada. Plaza de Atarazanas (Shipyards Square) or Plaza de la Catedral. Santander is pilot for a Smart city. It is embedded with 12,000 sensors. First, the School of Navigation, part of the University of Cantabria, and in the background, the Palacio de Festivales de Cantabria. University of Cantabria is the largest university in Cantabria. European University of the Atlantic is a private university founded in 2013. Universidad Internacional Menéndez Pelayo (UIMP) specializes in teaching Spanish language and culture to foreign students. Santander has a great tradition and cultural activity, with events that play an important role in cultural and social life of the city. UIMP is a major international summer university and organizes large festivals of music and dance. The Festival Internacional de Santander (FIS), Festival Internacional de Música de Órgano (FiMÓC), Encuentro de Música y Academia and the Paloma O'Shea International Piano Competition are main cultural events. Regional Museum of Prehistory and Archaeology of Cantabria. Palace of Festivals of Cantabria. Palace of Exhibitions and Congress of Santander. 'Cantabria Child Day' in the campa of la Magdalena. January 5: The Cavalcade of Magi covers a small part of the city, from the Palacio de Festivales to the Plaza del Ayuntamiento. The first Sunday of June: Cantabria Child Day is celebrated on Magdalena. It is a 'Regional Tourist Interest', an exaltation of the native, organized by the "Association for the Defence of the Interests of Cantabria" (ADIC), an association founded by Miguel Ángel Revilla. In this event are shown, among other things, an exhibition of "Aluche" (Ancient Cantabrian Fighting) and types of rural sports like milkmaid racing, archery, salto pasiego and wood chopping. Monday of Pentecost: Fiestas de la Virgen del Mar. June 24: The Bonfires of Saint John is celebrated in El Sardinero, particularly in the second beach of Sardinero. This festival celebrates the arrival of summer with a bonfire and a pilgrimage. In other parts of the municipality bonfires are also made, as in la Albericia and the Barrio Pesquero neighborhoods. July 25: Festivals of Saint James (Regional Tourist Interest). August 30: Feasts of the Holy Martyrs (Emeterius and Celedonius). Santander patrons. Santander's cuisine is based mainly on seafood, for which it has a high reputation in the Iberian peninsula. A gastronomic tour could start at the Barrio Pesquero, continue through Puertochico, El Sardinero, and end at Corbán. 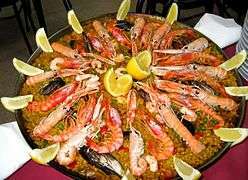 Shellfish include amayuelas (clams) and morgueras (razor clams); fish include seabream, red mullet, anchovies, seabass and sardines; and there are also squid and cuttlefish. 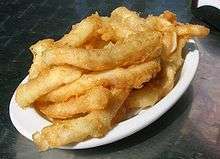 Some typical dishes from the city of Santander are the fried calamari called rabas and double donuts, in addition to leading the aforementioned cocido montañés and fish and seafood dishes ranging from seabass and sardine to products such as the morguera. Santander's restaurants offer excellent local cuisine, based on its exquisite local produce. Palacio de Deportes in El Sardinero next to the Campos de Sport de El Sardinero. In this city the Spanish first division Racing de Santander football team, one of the historic and certainly that was one of the founders of La Liga, play their home games at the Campos de Sport de El Sardinero. Racing de Santander has been 40 seasons in first division and 32 in second. In the 1930/1931 season, it finished second level on points with Athletic Club Bilbao (champion) and the Real Sociedad (third), that time was the one that came closest to winning the league championship. A long tradition in the city was handball, with CB Cantabria as a banner that has taken the name of Santander in Europe and the world with the achievement of several international titles, the European Cup in 1994,the Recopa in 1990 and 1998 and the EHF Cup in 1993. Currently, the club is dissolved. The only team that has an important place in the national scene at the moment is the Adelma Santander 2016, belonging to the Handball Club Sinfín. It competes in the category of the División de Honor Plata (second division). View of the city from the Bay of Santander. ↑ Fernández González, Lorena (2002). Santander una ciudad Medieval. Estvdio. ISBN 9788495742056. ↑ "Catholic Encyclopedia: Santander". Newadvent.org. 1 February 1912. Retrieved 14 April 2011. ↑ Ringrose, David R. (2005). Toward a contemporary city: Santander, 1755-1910. Ed. Universidad de Cantabria. p. 7. ISBN 9788481029772. ↑ Aupí, Vicente (2005). «El Incendio de 1941 en Santander». Guía del Clima en España. Omega. p. 75. ISBN 84-282-1370-4. Consultado el 16 de mayo de 2013. ↑ "Extreme values for Santander". Aemet.es. Retrieved 22 July 2015. ↑ "Extreme values for Santander, Ciudad". Aemet.es. Retrieved 22 July 2015. ↑ "Valores Climatológicos Normales. Santander / Aeropuerto". July 2011. ↑ "Santander". Spain: Cantabria and Asturias. Rough Guides. Retrieved 24 December 2015. ↑ "Santander election results". Elpais.com. Retrieved 14 April 2011. ↑ David de la Garma. 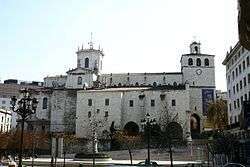 "Catedral de Santander" (in Spanish). Arteguias.com. Retrieved 14 April 2011. ↑ "City of Santander". Cantabriajoven.com. Archived from the original on 2 January 2011. Retrieved 14 April 2011. ↑ "Palace of La Magdalena, History". ↑ "History Eurostars Hotel Real". Retrieved 2014-12-15. ↑ "Gran Casino Sardinero". Retrieved 2014-12-15. ↑ "Lighthouse of Cabo Mayor". Puertosantander.es. Retrieved 14 April 2011. ↑ J. F. R./Santander (1 December 1997). "El Parque de Las Llamas quedará abierto al público el próximo viernes.". Eldiariomontanes.es. Retrieved 14 April 2011. 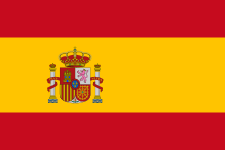 Wikimedia Commons has media related to Santander. Wikivoyage has a travel guide for Santander. Webcams de Santander y Cantabria — Live webcams Santander and Cantabria. Ayuntamiento de Santander — Official website of the Santander City Council (In Spanish). Webcam en Puertochico — Live webcam of Santander's Puertochico district.